We’ll help you get into the swing of summer with patio hangouts, live music, and great craft beer. Stop by our brewery on Clifton Hill to discover the best of Niagara craft beer in a pretty awesome location just steps away from Niagara Falls. What’s on the Rotating Taps? Marzen – German for “March” – is a medium to full body lager from Bavaria that’s traditionally brewed in March and served at the state’s Oktoberfest celebrations. Our own version of the popular Marzen beer is now on the rotating taps, featuring a malt sweetness, hints of caramel up front, and a clean dry finish, making it a great choice for some summer sippin’. Named after missionary and explorer Louis Hennepin who brought Niagara Falls to the world’s attention back in the 17th century, our Hennepin Stout is a traditional Irish Dry Stout that’s creamy, lightly carbonated, and 4.3% alc. It plays up aromas of sweet malt and caramel and is the perfect choice for all of those stout lovers out there. Our American Pale Ale has a bready malt body that supports a complex hop profile. Citrus flavours up front give way to tropical hints of pineapple, mango, papaya, and berries, offering a super refreshing and flavourful beer unlike any APA you’ve tasted before. 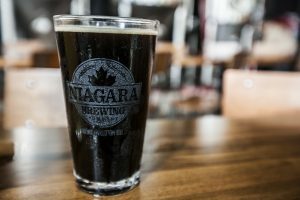 We also have a great Cream Ale on our rotating taps and four signature brews including the Niagara Premium Lager, Amber Eh! Ale, Beerdevil IPA, and Honeymoon Peach Radler. Grab some cans or a growler and take them to go, or sit and have a beer with us on one of our patios. Our main patio sits right on Clifton Hill and features daily live music from awesome local musicians, while our rooftop patio gives you amazing views of Queen Victoria Park, Clifton Hill, and the area around Niagara Falls. Our Beerdevil IPA Wins Silver at the 2018 Canadian Brewing Awards!